1Active since the mid-eighties, Alain Huck is a Swiss artist born in 1957. After having explored various media in sculptures and small paintings, from 1993 to 2007, he kept a personal diary of 269 drawings entitled Vite soyons heureux il le faut je le veux (“Quick, let’s be happy, we must, I want it”: henceforth referred to as VSH), in which he found material for his latter works. Since 2006 he has been using charcoal for monumental works on paper which depict forests and – as studied in this paper – explore historical issues. 2Alain Huck’s approach to History is three-pronged, with these three dimensions often being interwoven in each of Huck’s works. First of all, Huck’s reflection on History is originally the outcome of private tragedy: grieving the death of his child. Huck’s rendering of historical and collective trauma in his drawings echoes his personal experience of bereavement. As such, even if his artistic practice cannot bestow meaning to trauma, it does give Huck a sense of anchoring which allows him to approach the general from the point of view of the particular thanks to synecdoche. Secondly, Huck’s analogical approach is best understood with references to literature, which feed his artistic practice, notably works by the German-born novelist, poet and essayist W.G. Sebald which hinge upon the history-memory-trauma triad. Huck’s impossible quest for meaning, however, leads him to look beyond Sebald for other authors who similarly have biography and History interact. In that perspective, Huck’s charcoal drawings subtly incorporate literary references from a wide array of writers – Ibuse, Schmidt, Graq and Konrad – that only become fully explicit in the Hommage à series. Last but not least, Huck also resorts to the notion of diachrony to explore the discrepancy – not to say the indelible rift – between experienced situations and their historical accounts. For instance, to do so, Huck had the idea of conflating all catastrophes that shattered Pisa in one original single charcoal drawing that is modelled on a medieval fresco. Still with the same objective, Huck convenes heterogeneous events in multi-entrance installations that are best made sense of with the help of notions like “revenant pasts” (developed by literary historian Jean-François Hamel) and “montage” (as used by Georges Didi- Huberman). This article will eventually suggest that Huck selects the motif of “the hut” to embody the possibility of reconciling private stories and collective/ public History, while offering a shelter for the individual. In fine, the hut operates as the symbolic place of intimate retreat, along the lines of Pliny’s dream of life in Arcadia – or in another words, the hut stands for a concrete refuge soothing the troubled sleep of human beings. 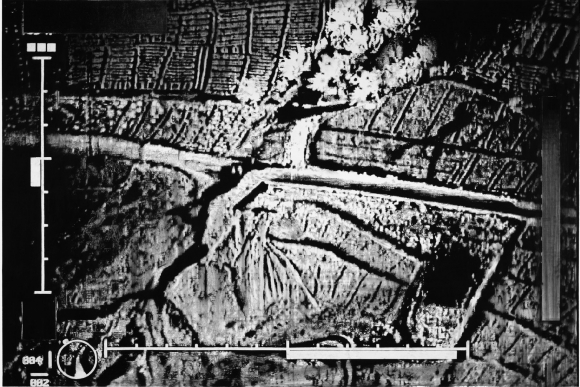 2 Muriel Pic, W. G. Sebald – L’image papillon, Dijon: Les presses du réel, 2004, p. 11. 4 Masuji Ibuse, Black Rain (1966), trans. John Bester, Kodansha, 2012, p. 23. 5 W. G. Sebald, On the Natural History… op. cit.., p. 30. 4With the series siemens primus linear accelerator landscape (2006), Huck performs an act of memory we witness, like foreign travellers staring out of a train window. He had to resolve himself to look at the world as it was after. Grieving leaves no visible monument, no ruins. The first large-scale landscape Huck drew was a delta, that is to say, literally, the place where a river leaves its bed and comes apart, loses its course, frays, before disappearing into the sea. What does one do after the disaster? Huck answers only with hesitations. In a way, he follows on from 19th-century Romantic thought, which associated landscape and moods, but to this tradition he adds another, that of Surrealist automatic writing, in order to fill this delta with words. 5An unfinished work of Huck’s consists in filling a similar landscape with a literary narrative: Heart of Darkness by Conrad. To this kind of tripartite dialectic, which combines biographical narrative, literary revivals and historic considerations, must be added the fundamental anchor in another story: the story of art. 7In returning to that fresco, Huck is not acting as a historian but making a subjective artistic work that plays with time and shows its eternal return, contesting the idea of progress. 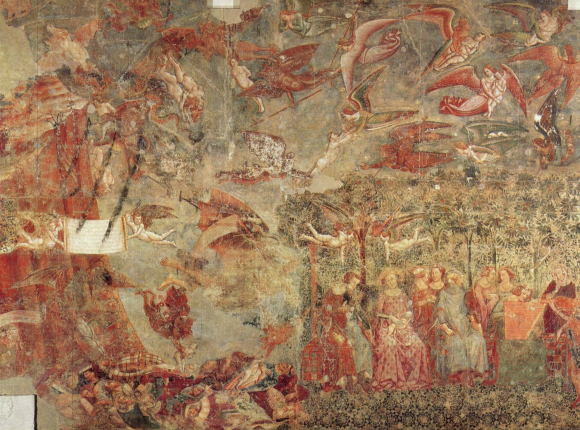 The four walls of the room painted by Buffalmacco form a coherent programme: Hell and The Last Judgement face each other, and on adjacent walls The Thebaid (the life of the Desert Fathers) and The Triumph of Death. The latter [fig. 1] is divided into two parts, separated by a narrow mountain that, according to Jérôme Baschet, “shows in closed form what the Judgement represents as a cross section.”8 On the left is the classic theme of The Three Living and the Three Dead. Horsemen are blocked by three coffins and Macaire points out to them the only remaining path: the steep path of hermits whose life is displayed in detail opposite. On the right is a more unusual scene: death, with the features of a woman with claws and bat’s wings, a snake in her blond hair, and flies. She is brandishing her scythe, towards a group of characters who are amusing themselves in the woods. She will cut down everything, both men and trees, and in her wake bodies will pile up, their souls fought over by angels and demons. In art history terms, it is a key image in the representation of death. “While Buffalmacco’s predecessors were both rare and hesitant,” Baschet observes, “those who followed him were just as numerous and inspired.”9 He was, without a doubt, a pioneer, but how inglorious this Triumph is if we compare it to the various representations of the Last Judgement. That is because death is not a culmination, it is merely the daily advance of desolation, which is constantly renewed. Figure 1: Buonamico BUFFALMACCO, The Triumph of Death, fresco at Camposanto, Pisa. 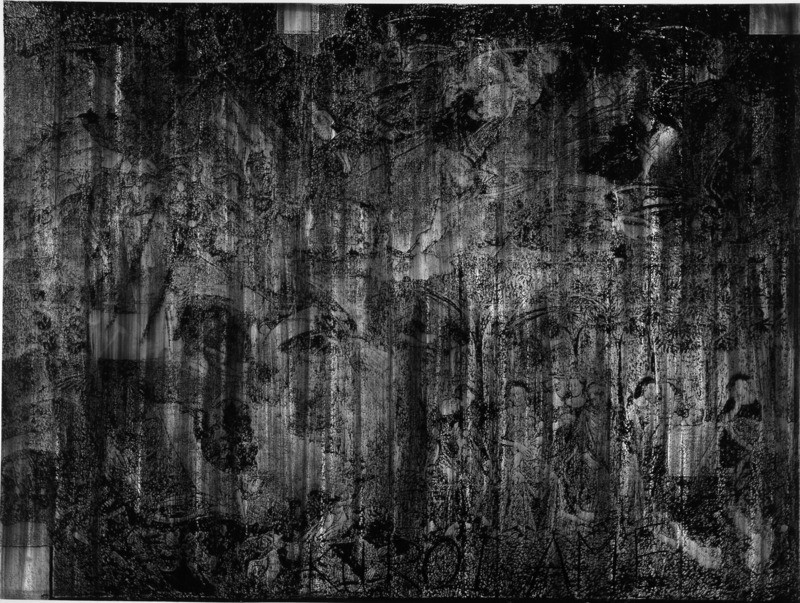 Figure 2: Alain HUCK, Kuroi Ame, 2007, charcoal on paper, 250x368 cm, private collection Geneva. ©David Gagnebin-de Bons. 10 Masuji Ibuse, Black Rain, op. cit., p 98–99. And on this expanse of ash fell the black rain, treacherous, at first indelible, its irradiating effects to be felt for years after, ensuring the long-term triumph of death. 11 Ibid., pp. 34-35, 93. 9Reading the descriptions of these tumefied, burned faces, from which hair and teeth have fallen, one thinks of the Thanatophanies (1995)12 by On Kawara - the deformed faces of survivors, straight out of some medieval Hell, giving a deeply moving dimension to this artist who, every day, would telegraph I am still alive and who counted his age in days. Figure 3: Alain HUCK, Chrysanthemum III(Hanabiseries), 2013, charcoal on paper, 210 x 152 cm, private collection Geneva. ©David Gagnebin-de Bons. 13 This is the commonly accepted etymology of chrysanthemum, formed by χρυσα and θεμον. 15 Masuji Ibuse, op. cit., p. 195. 12Here, the bodies of the school students themselves constitute the imperial flower. This repetition of the chrysanthemum motif at each stage of the disaster (clouds, victims, then retrospective madness) seems to pursue the emblematic image of the nation like a stain. In Japanese writers, this phenomenon can no doubt be linked to a second, but no less violent trauma: the capitulation of the Emperor. As for Huck, any form of power or authority is on principle suspect. 16 Walter Benjamin, “Theses on the Philosophy of History,” op. cit., p. 257. 13While Huck has always collected newspaper articles, alongside various fragments from everyday life, notably to nourish VSH, the two Kuroi Ame drawings are his first real attempts to tell a historical story – whether or not it is considered more true: “To articulate the past historically does not mean to recognize it ‘the way it really was’ […] It means to seize hold of a memo as it flashes up at a moment of danger.”16 The first marker of a historical project with Huck is juxtaposition: it would be tempting to write montage if fundamental differences didn’t emerge in relation to the Warburgian or Brechtian methods that Didi-Huberman has put in perspective. For, if he sometimes places his works side by side, as we shall see, in order to bring out a meaning from their proximity, it is primarily through a play on the translucency of images that he tries to look at through History, to elaborate something like a diachronic clairvoyance. The resurgences, the reiterated catastrophes that he designates associate his work with a poetics of repetition for which Jean-François Hamel uses the term revenances. 14Although his analysis concerns only writers, Hamel nevertheless uses a description of Huck’s method as a metaphor for their own creative process. 18 Ibid, p. 208. Italics mine. 16When Huck juxtaposes diachronic images, it is not to organise a “great narrative” that would go “from antiquity to our times,” but to signal contaminations and gaps (écarts20) that we can dream on. 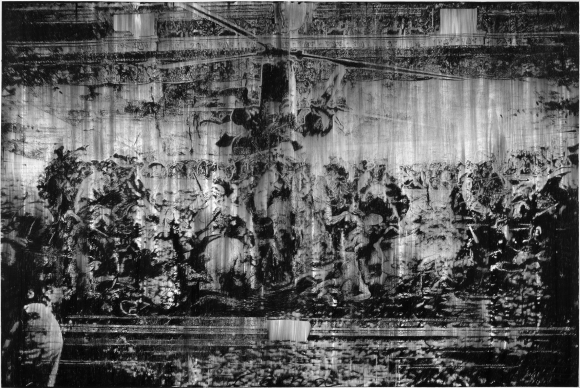 This is the case with Banquet (2010) [fig. 4], which combines a Raphael painting that was completed by Giulio Romano, the photograph of a helicopter with American soldiers, and the Latin word cena. The painting, now in the Hall of Constantine at the Vatican, represents The Battle of the Milvian Bridge, a battle at which Maxentius was defeated, allowing Constantine to take power over the Western Empire. The story of this battle is told by Lactantius and Eusebius of Caesaria. The latter, who is close to the emperor, sees it as more than a battle for succession: as the confrontation between two cultures and the victory of Christianity over paganism. Eusebius tells how Constantine saw a Christ symbol (☧) in the sky and used it as a standard, and how his victory was the prelude to the Christianisation of the empire.21 Above all, Eusebius structures his narrative around a method of exegesis inherited by the Alexandrian Church Fathers, and in particular by his master, Origen: typology, that is, a way of comparing two events (usually, one in the Old and one in the New Testament) in order to show how the first prefigures the second. Figure 4: Alain HUCK, Le Banquet, 2010, charcoal on paper, 251x370 cm, Museum of Old and New Art, Tasmania. ©Virginie Otth & Nicolas Liebherr. 22 Meyer Shapiro, Words, Script and Pictures, Norton, 1996. 17Throughout his narrative, Eusebius thus intertwines and compares Pharaoh’s death when pursuing the Hebrews and that of Maxentius when he was routed by Constantine, as if one was replaying the other. “Lex est umbra futurorum”: the Law is the shadow of things to come, wrote the poet Adam de Saint-Victor, referring to the books of the Pentateuch (“the Law”). Meyer Shapiro takes up this formula to describe the visual typologies put in place by medieval artists, especially in the “Moralised Bible” of the thirteenth century.22 It was precisely this bible that Arnulf Rainer chose to work on by covering it with his own drawings, using a process of obstruction that he calls Übermalungen, or “overpainting.” This obliterating, a vehement and anachronous commentary, could, to a certain extent, be compared to the smears of charcoal that veil Huck’s works. In overlaying the painting in the Vatican with a contemporary war scene in his drawing, Huck is not bestowing prophetic significance on the former, but observing a phenomenon of revenance in history. Massacres, clashes between cultures, come back like the seasons, always comparable but in a way that never gives them any true meaning. 23 Florence Dupont, op. cit., p. 51. 18This is only the absurd storm “that we call progress.” And that these scenes, repeated like a rite, should be associated with a banquet, implies a supplementary gap. The Roman cena is the place of a symbolic change, of a highly codified commensality, of a sharing of a luxury that “is inscribed in a system of giving and counter-giving, and contributes to the strengthening and extension of the sociability network that founded the power of a man or a family.”23 In Christian tradition, the cena is the moment of sharing bread and wine. In Huck’s drawing, however, cena alludes above all to The Ash Wednesday Supper [La Cena de le Ceneri] by Giordano Bruno,24 a dialogue in which the defrocked Dominican opposes both the cosmological and theological conceptions of the Catholic Church. His post-Copernican ideas, allied with an anti-Trinitarian dogma, were considered blasphematory in a number of ways leading him to be burned in Rome in 1600. As often in Huck’s work, the title plays a mediating role and, by the contrasts of its polysemy, heightens the violence of the image. 19At the Camposanto in Pisa, the four paintings on the walls of the Hall of The Triumph of Death form a complex programme. Hell answers The Last Judgement, and the anchoritism of the Thebaid answers the promise of death that hangs over those who remain in the world. This four-part system could be interpreted as a prototype of the large installations conceived by Huck since 2011. 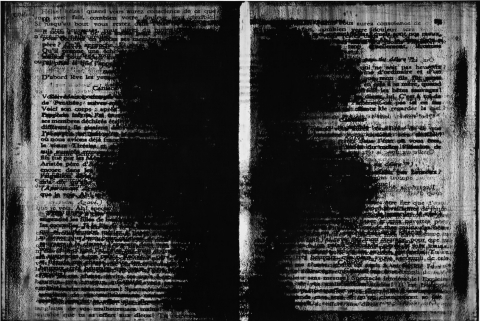 Tragedy or Position (2011) thus brings together four drawings facing each other in pairs: Nebula and Edenblock on one side, and Tragedy and Position on the other. 25 In French, démonter and remonter. 20Nebula hides a masterpiece of monumental Baroque painting, the Allegory of Divine Providence (1633-1639) by Pietro da Cortona at the Palazzo Barberini in Rome. It is famous for its illusion of being open towards the sky, with the Crab Nebula, the remnant of an exploded star – a dis- aster literaly – its name considered baneful by the association with cancer. Opposite, Edenblock shows an artificially paradisiac, proliferating glasshouse. A garden enclosed in a glass box, that cannont be entered because its walls are so thick, it is a denatured version of the Garden of Eden. In a way, the two drawings are an answer to Buffalmacco: to the triumph of death, the negation of providential triumph; to the hermit’s withdrawal from the world, the confinement of a fake paradise. To complete the square, Tragedy [fig. 5] reproduces the text – the centre of which is also hidden, but, this time, by the shadow evoking once more the mushroom cloud from an explosion – of an excerpt from the Bacchae by Euripides. The two pages are both redoubled, further hampering our reading, but the episode can be reconstructed. It concerns the dismembering of Pentheus by his mother, driven wild by Dionysos. The god thus judges and punishes someone who opposed his cult with a torture that is every bit as rich as the very fertile imagination of the Christian hells. The words can be deciphered only in fragments. The first, and perhaps most legible one, resonates like an endlessly repeated prophecy: “Alas, alas, when you realise what you have done, how your grief will…” Opposite, Position [fig. 6] shows an (Afghan) landscape seen from the sky, framed, measured and therefore made legible for a viewfinder that might belong to a surveillance drone or a bomber. To this juxtaposition of images Huck thus adds a process of association or – and now we can venture the term – montage. The method is paradigmatic of much of the art of the twentieth century. Georges Didi-Huberman sees it as a tool for making history by “dismantling” and “reassembling it.”25 Referring, for example, to Bertold Brecht’s Kriegsfibel (War Primer), he shows how, by anachronistic or impertinent associations, “elements – images and texts – take position instead of constituting themselves as discourses and taking sides.”26 The words coincide almost too neatly. The montage effected by Huck in this tetralogy — and indeed in those that follow – corresponds to what Didi-Huberman calls a “dys-position,” that is to say, the juxtaposition of heterogeneous elements that generate a rearrangement, a “remounting” of meaning. In the centre of the four images the viewer is not only positioned between two facing elements, but will move his gaze in circular fashion. To the great historical gap (from Euripides to the wars of the twenty-first century) he adds a gap that is less geographical than cosmological: the astral and the glebe, the paradise of painters and the hell of playwrights, the desert-like and the tamed jungle. Between these four drawings the ordinates of time thus intersect with an abscissa indicating scale. 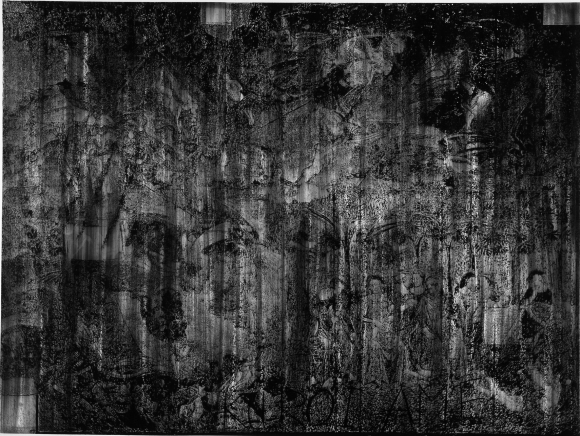 Figure 5: Alain HUCK, Tragedy (Tragedy or Position), 2011, charcoal on paper, 271x400 cm, private collection Geneva. ©David Gagnebin-de Bons. Figure 6: Alain HUCK, Position (Tragedy or Position), 2011, charcoal on paper 271x400 cm, private collection Geneva. ©David Gagnebin-de Bons. 21A comparable process is at work in Ancholia (2012). This is the title of a complex installation comprising four drawings hung around a metallic structure entitled Tentation [fig. 7]. To conclude this rapid look at Huck’s work, let me focus on this minimum building made of aluminium logs, which must be associated with a kind of hut, a primitive construction. In the Ancholia installation, this sculpture serves as a pivot, mediating, connecting, informing the four drawings. 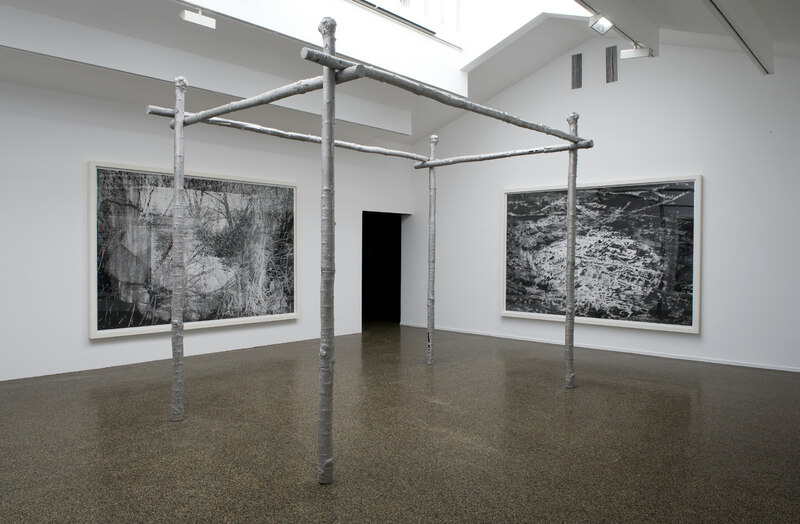 Figure 7: Alain HUCK, Ancholia, 2012, exhibition view at Swiss Cultural Center of Paris, private collections Switzerland and France, ©Marc Damage. 23Self-contained, out of the world, the cabin is an important element in Huck’s imagination. There is one hidden, indeed, behind a wall of the studio: it contains a bed, a painting and a few books. Velum (2008), the drawing of a bed lying under a brain-shaped sculpture and occupying the full width of a fold, featured in a small exhibition in Romainmôtier in 2014. It was hanging from a length of wall set back from the other three, as if to mark out a space of germination from which the ideas for the other works might have sprung. That is what is illustrated by drawing no. 111 of VSH, showing a hut lodged in a skull. Like Grange’s “Roof,” in Julien Gracq’s novel A Balcony in the Forest, the cabin is an intermediary place between the real and the inner worlds, where we can move between the two and, above all, contaminate the first with the second. Installed in a park in summer 2014, Le Résident (2014) is a good example of this. From the outside all we can see is a portakabin-type work hut. When we try to enter, a wooden structure blocks access to the inner part, where we see a bed of fern and copies of Heart of Darkness by Joseph Conrad. A spray of sagging leaves, suspended, projects its shadow on the back, on the projection of its own enlarged image. We can now imagine the chimera of Kurtz, Conrad’s hero, delirious and feverish in the depths of a jungle that he has begun to enslave at the price of his own dehumanisation. The cabin is thus an ambiguous place. It is the primary construction: for humanity, the beginning of history; for individual childhood, the place of stories. The artist has made a place of rest, of withdrawal, but where the most anxious and deep-buried phantasmagorias are also gathered. 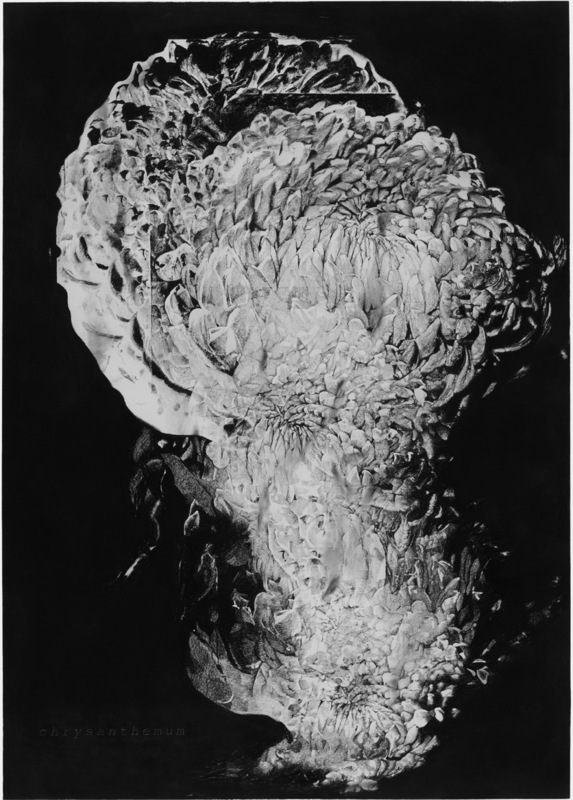 Figure 3: Alain HUCK, Chrysanthemum III (Hanabi series), 2013, charcoal on paper, 210 x 152 cm, private collection Geneva. ©David Gagnebin-de Bons. 1 This paper is extracted and rearranged from the bilingual book Alain Huck. La symétrie du saule [The Symetry of the Willow], Genève, Mamco, 2015. It has been translated by Charles Penwarden. I am also deeply indebted to peer-reviewers & editors for numerous linguistic corrections, and to Catherine Marcangeli & Stéphanie Prévost for the translation of the introduction. 1 This is a study for the Deposition of Christ kept at the Uffizi Gallery in Florence, which Huck had also copied in VSH, no. 239 Pontormo caro due, 2005. The resemblance between these ochre hues and the undercoat of Renaissance frescoes has been noted by Julie Enckell, “Alain Huck: la friction et le double,” Alain Huck, 2006, exh. cat., Zurich, jrp|ringier, Musée Jenisch, Vevey, 2006, pp. 1, 6. 3 W. G. Sebald, On the Natural History of Destruction (1st German edition, 1999), trans. A. Bell, Modern Library, 2004, p. 24. 6 hésiter un matin sur deux hésiter un matin sur trois trois fois sur quatre oublier jamais le soir bouger à chaque fois vers midi ou après midi bouger à chaque fois le soir hésiter tous les matins. These are the first lines of no. 155 in VSH, which, Huck combined for Le Delta with drawing no. 198. At the bottom of this was the verb hesitate. 7 The authoritative study that attributes the frescoes to Buffalmacco and dates them to the late 1330s is by Luciano Bellosi, Buffalmacco e il Trionfo della Morte, Turin: Einaudi, 1974. 8 Baschet closely links Hell and The Last Judgement because of their similar compartmented structure. However, only Hell truly presents a clear section, which in effect is quite comparable to a mountain. In contrast, The Last Judgement is a moment rather than a place, and as such it is not defined by topological markers. Jérôme Baschet, “Triomphe de la mort, triomphe de l’enfer. Les fresques du Camposanto de Pise,” l’écrit-voir. Revue d’Histoire des arts, no. 8, 1986, pp. 5-18, p. 12 for the quotation. 14 Kenzaburō Ōe, Teach Us to Outgrow Our Madness, (1st Japanese edition : 1966), trans. John Nathan, New York: Grove Press, 1977, p. 9, 154. 17 Jean-François Hamel, Revenances de l’histoire. Répétition, narrativité, modernité, Paris: Minuit, 2006, p. 10. Italics mine. 19 Ibid., p. 209. The question of alteration refers, by a verbal shift, to that of alterity, analysed in chapter II. 20 I take the notion of the écart, as well as that of grand récit (great narrative), from Florence Dupont, who has devoted her career to subverting any kind of genealogy leading, indeed, from antiquity to the present day. Florence Dupont, L’Antiquité territoire des écarts, Paris: Albin Michel, 2012. 21 Eusebius of Caesarea, Life of Constantine, Stuart Hall (ed. ), trans. Averil Cameron, Oxford University Press, 1999. 24 Published in 1584, The Ash Wednesday Supper by Giordano Bruno can be found in a multilingual edition by the University of Canada Press, Downsview, Ontario in 1995. 26 Georges Didi-Huberman, Quand les images prennent position. L’œil de l’histoire 1, Paris: Minuit, 2009, p. 118. 27 Arno Schmidt, “Scenes from the Life of a Faun,” trans. John E. Woods, in Nobodaddy’s Children, Dalkey Archive, 1995, (1st German edition: 1953), p. 56.